Dhaka, 5 April, Abnews: Describing Islam as a religion of peace, Prime Minister Sheikh Hasina on Thursday emphasised the need for real teaching of Islam in the country. “We want Bangladesh to be built with a non-communal spirit. The people of all faiths will practise their own religious rituals properly. This is the principle of Islam,” she said. The Prime Minister made the remark while inaugurating construction works on nine model mosques and Islamic cultural centres in different places of the country through a videoconference from her official residence ‘Ganobhaban’ in the city. The nine mosques and centres are being constructed under a project titled ‘Establishment of a total of 560 Model Mosques and Islamic Cultural Centers in each District and Upazila’ of the country. 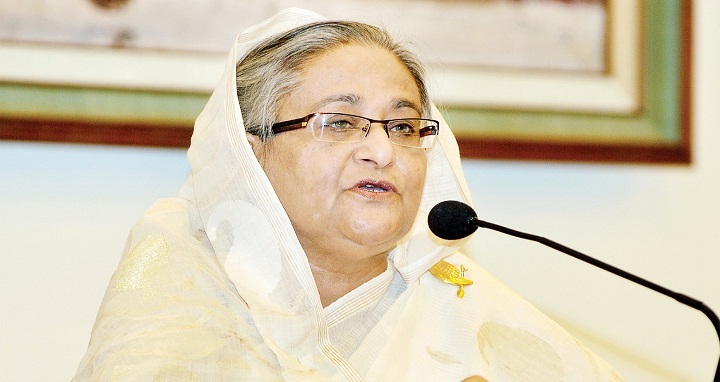 Sheikh Hasina said her government has taken the initiative to set up the model mosques and Islamic cultural centres in every district and upazila so that people can get the real teaching of Islam and exercise Islamic culture properly. “We want the image of our holy religion to be upheld. Islam is a religion of peace. We want the peace to prevail,” she said adding that the dignity of Islam is being defamed by killing innocent people and carrying out militant and terrorist acts in the name of the holy religion. Recalling that Father of the Nation Bangabandhu Sheikh Mujibur Rahman established the Islamic Foundation in March, 1975, Hasina said it was the spirit of the Father of the Nation that the people from all religions would perform their own religious rituals freely in this country. Later, the Prime Minister heard the speeches of imams (religious leaders) and public representatives of Tungipara upazila of Gopalganj, Chittagong, Mymensingh, Noakhali, Dakkhina Surma of Sylhet, Khulna, Rajapur of Jhalakati and Sherpur of Bogura district through the videoconference from Ganobhaban. The Prime Minister also talked to Opposition Leader Raushon Ershad through the videoconference while inaugurating the model mosque in Mymensingh. Religious Affairs Minister Principal Matior Rahman also spoke on the occasion, while Principal Secretary Md Nojibur Rahman conducted the videoconference. Religious Affairs Secretary Md Anisur Rahman made a brief description of the project through a power-point presentation. He informed that construction works on more 100 mosques will start by the end of 2018. A video documentary was screened on the project. The district-level model mosques will be four-storey ones, while that of the upazila-level model the three-storey ones. The model mosques to be constructed in coastal areas will be four-storey ones with the ground floor remaining vacant for use as shelter centres during any natural disaster. A total of Tk 8,722 crore will be spent on constructing the mosques and centers.